Because Houdini was too old to serve during World War I (he did try to enlist), he instead took up the challenge of selling "Liberty Bonds". During one fund raiser at the New York Hippodrome, a man in the audience offered to buy $1000 worth of Bonds if Houdini could get out of his shirt in 30 seconds. Houdini tore off his shirt in six. The man then offered another $1000 for the torn shirt. By the end of the war, Houdini is said to have sold $2 million worth of Bonds. Amazingly, Houdini is still at it today! 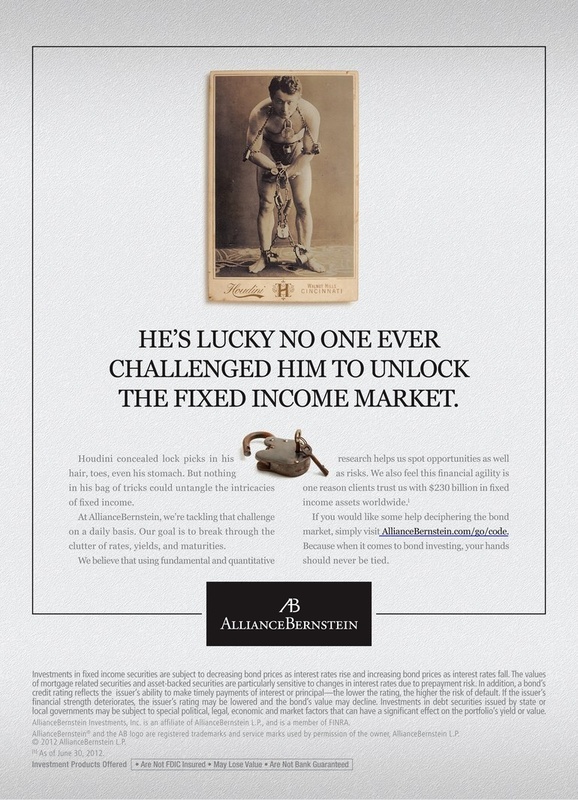 Our friend Joe Hanosek sent over this advertisement for investment firm AllianceBernstein featuring our favorite Bonds salesman. This ad appears in the November 2012 Investment Advisor. War Bond shirt story from The Secret Life of Houdini by William Kalush. Great ad, fantastic old card and a lock that looks old, too! The photo of Houdini is reversed.